Another gorgeous Themes Kingdom production! 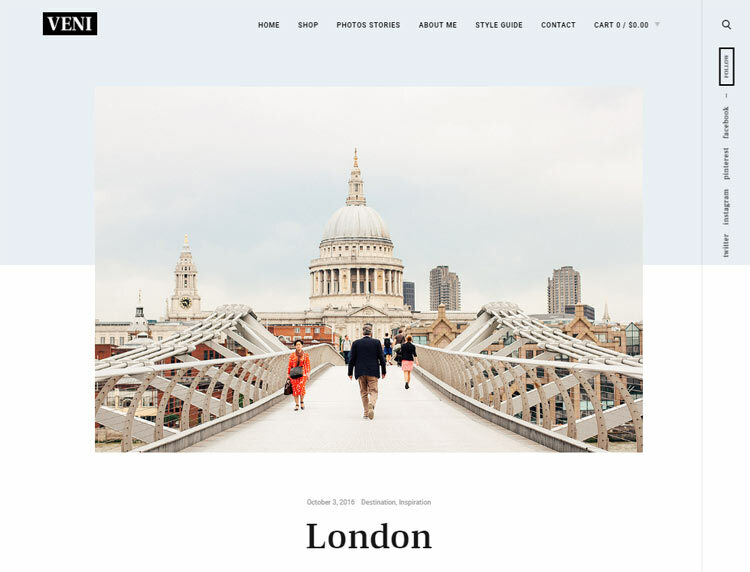 Veni is a high quality blog, magazine and shop theme with a perfectly executed design. The design of Veni does follow some popular trends that you see in the theme marketplaces these days but Themes Kingdom always seem to be able add unique and beautiful twists to common design trends. This is what makes them one of favourite theme shops. In the case of Veni you can see one of these unique twists immediately when you look at the demo and see the neat sidebar on the right hand side. Not only is it very user friendly but it adds a bit of flair with its subtle animation as you scroll down the page. 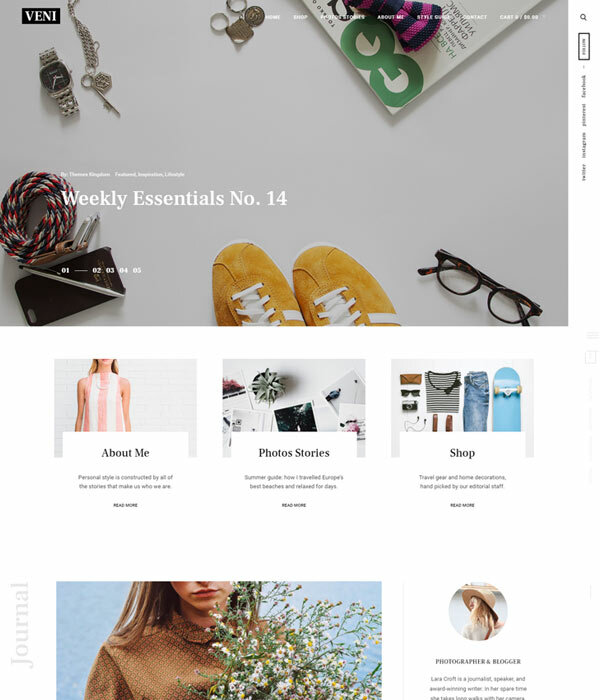 Take a look at an article page and you’ll see why Veni is perfect for many magazine and blog themes – especially fashion and lifestyle blogs. The typography is perfect and the articles look beautiful as well as being very clear and easy to read. Veni is also WooCommerce compatible and has all the styling you need for a nice and simple shop. In fact, the shop design is probably one of the most minimal WooCommerce themes I’ve seen! One of the things that really makes Veni stand out is the great job Themes Kingdom have done with animations. I’ve already mentioned the lovely sidebar animation but there are lots of other subtle effects all over the theme – from hover effects to page transition effects. They really help to give Veni a premium feel. Veni has simple and easy to use theme options in the admin area. The WordPress customizer is used to allow you to make plenty of changes and see the changes live in the browser. You can completely change the color and font options and also choose between some great layout options. I’m blown away with the Veni theme. It’s one of the best looking themes I’ve reviewed in quite a while. If you’re looking for a blog, magazine or simple shop you wont be disappointed with Veni. With a 14 day money back guarantee you can try it without risk, so take a look at the demo now and see what you think. I really like the look of this theme. I’ve not bought it yet but it looks perfect for a project I’ve got coming up.